Give us a little credit. How long were Wolverine two-seater fans going to put up with a 700cc single when the four-seat X4 has the brilliant 850cc twin? 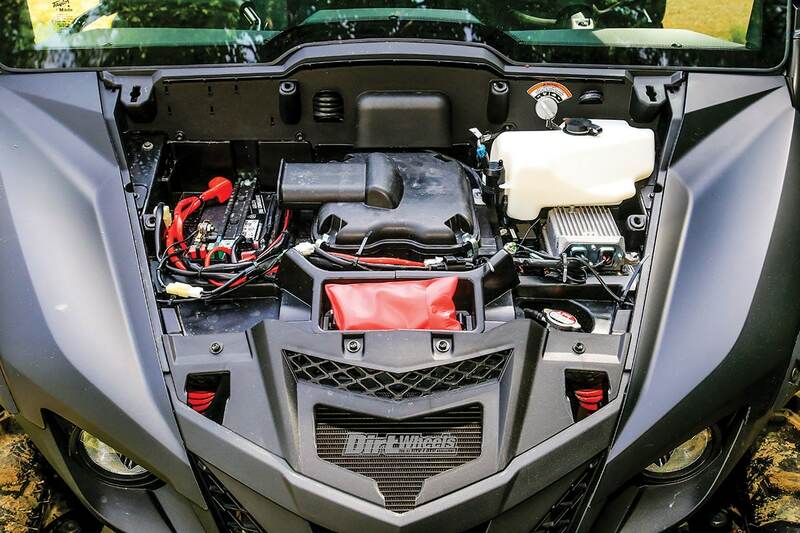 For 150cc of additional displacement you gain 47-percent torque? Yamaha put an enormous amount of work and engineering into making the X4 compact, smooth, quiet, comfortable and reducing heat in the cabin. You would have to want a dump bed pretty bad to leave the dealer with a Wolverine 700 when Wolverine X4s are sitting there. There could not be a more natural conclusion than to assume that a two-seater would follow on the heels of the X4. Once you experience a machine that has the features of the X4, where you can talk easily with other passengers, you will find it hard embracing old-school UTVs. We know, because we love quiet machines that don’t constantly make us aware of the mechanical energy and cacophony going on under the dump bed. We do want to feel the power, torque and acceleration, but not the seamy side of making that power. We were impressed with the trail composure that the Wolverine X2 exhibits in slippery and gooey running. It also handled some stunning cambers and heavy-duty rock hopping. 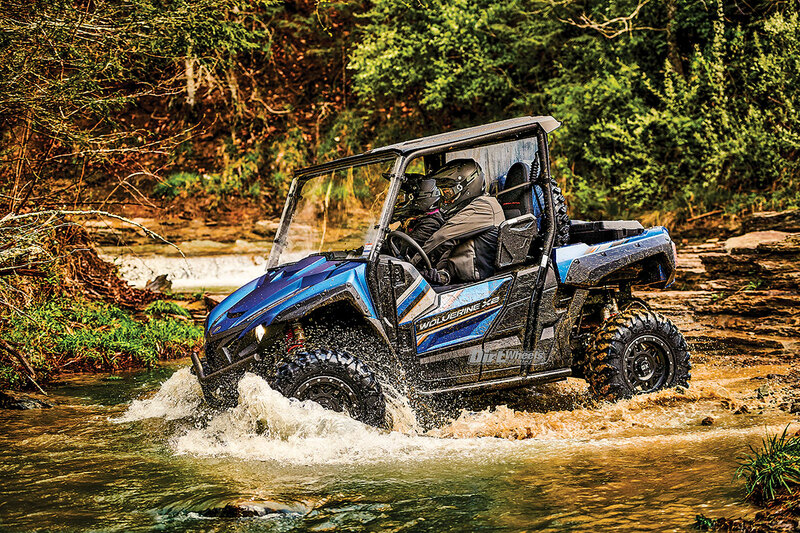 Yamaha product research showed that UTV enthusiasts care a great deal about true off-road performance, machine durability, reliability and comfort. It turns out that not all of those enthusiasts needed or wanted a dirt taxi that will carry four full-size adults. For many, one friend is enough if they can choose to carry more cool stuff, and the X2 allows you (and them) to carry 300 more pounds in the cargo area and tow 500 more pounds as well. Plus, the dump bed allows you the room to properly carry and distribute those 600 total pounds of cargo. Yamaha started from the ground up with a new chassis and a new 847cc in-line twin engine to develop the X4. It didn’t give up on the compact concept for the X2 and even furthered it, but there was no need to reinvent the platform for the X2 as there was with the X4. For some reason the front-seat area of the X2 didn’t feel as roomy as the X4, but it is nevertheless quite comfortable. The two-tone seats are part of the Special Edition package. The whole story of the X4 was that Yamaha didn’t modify an existing platform but started clean. This time it was exactly the reverse. Yamaha was totally starting with an existing platform, and that is fine since it is a brand-new platform. There were many comparisons, but they didn’t reveal that many changes from the X4. The X2 is slightly more compact. The most notable change in measurements was the 3-inch-lower total height. For the X4, the roll-over protection system (ROPS) cage needed to kick up in the rear to cover the rear passengers, the overall height dropped a couple of inches with the elimination of the rear ROPS structure. Having a dump is handy for cargo, but it also aids access to the adjustable rear shocks and the engine compartment. Note the large-volume muffler and the sound/heat insulation. What the numbers add up to are plenty of ability and capability on tight trails. The turning radius for the Wolverine X2 is 177.2 inches. That is a subtle improvement on the Wolverine 700’s 181.1 inches. Losing the rear seats and accompanying engine-covering bodywork didn’t have much effect on the sound. Yamaha made many strides on the X4’s sound suppression, including a muffler with over double the volume of the Wolverine 700. Those trends continue with the X2. Yamaha’s compact X4 is 122 inches long, but the X2 is only 115 inches long, and that is despite sharing the same wheelbase. Losing the rear seats and having an abbreviated ROPS lost some weight at 1,583 pounds compared to the X4’s 1,666. No doubt thanks to the twin-cylinder engine and beefier frame, the X2 is 255 pounds heavier than the single-cylinder Wolverine 700. For the expected heavy loading involved with packing all four seats on the X4 with adults, it was fitted with Sachs self-leveling rear shocks. Standard X2 models are fitted with KYB gas-charged twin-tube shocks with 12.5mm shock shafts and five-way preload-adjustable shocks. R-Spec and SE models feature KYB fully adjustable piggyback-style shocks with threaded rings for preload, high- and low-speed compression, and rebound adjustability. Those new KYB shocks work with the Yamaha-exclusive 26-inch Maxxis tires with an all-new tread pattern. Interestingly, the fronts are four-ply and the rears are six-ply. They mount on 12-inch cast-aluminum wheels. 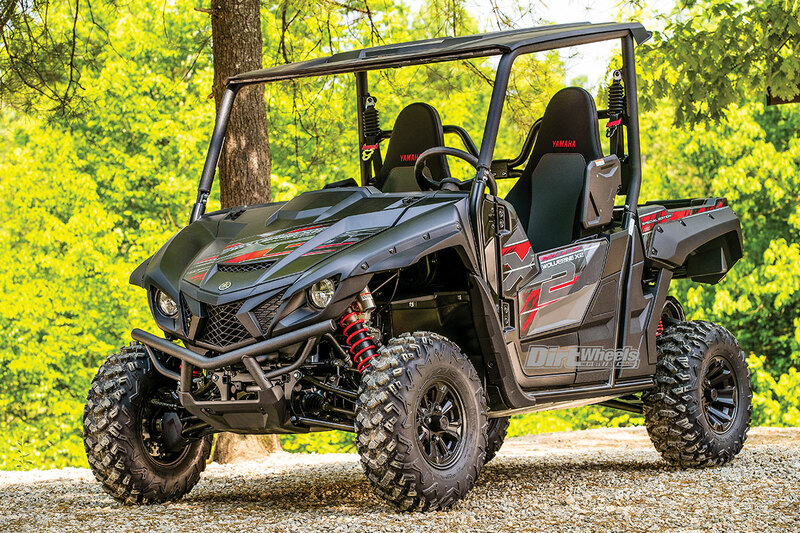 Most UTVs are switching to 14-inch wheels, but staying with 12-inch wheels for 26-inch tires makes for taller sidewalls and thus a more compliant ride. The bed also allows access to the oil filler, coils and spark plugs. It should also be easy to check valve clearance. There is a lot to like about Yamaha’s new 847cc parallel-twin engine and accompanying parts. There is a reduction in sound, heat and vibration, and a major increase in power and torque. 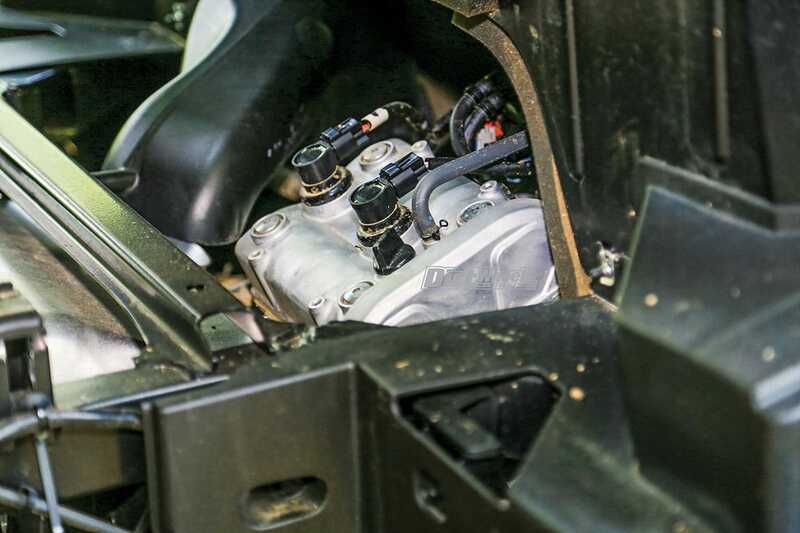 A twin is usually smoother than a big single, but Yamaha added a counterbalancer to the dry-sump DOHC engine. The oil needed for lubrication is pumped through the engine into a separate oil storage tank for cooling and to shorten the engine as much as possible. Rubber-mounting the engine with oversize mounts better isolates engine vibration from the frame, floor and steering wheel. 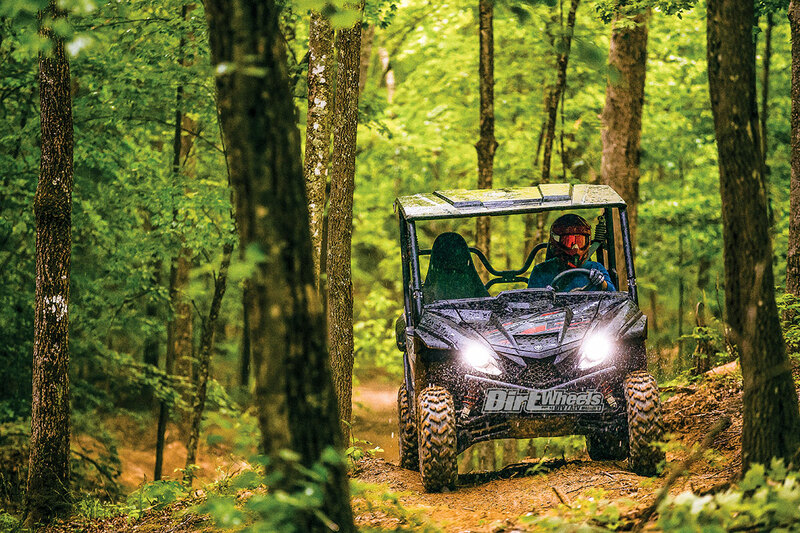 The new 850 twin is designed to offer excellent trail performance without relying on high rpm, and it uses lower shift points. The chosen shift points minimize sound and relax the feel of the engine. Under the hood there is a lot going on. 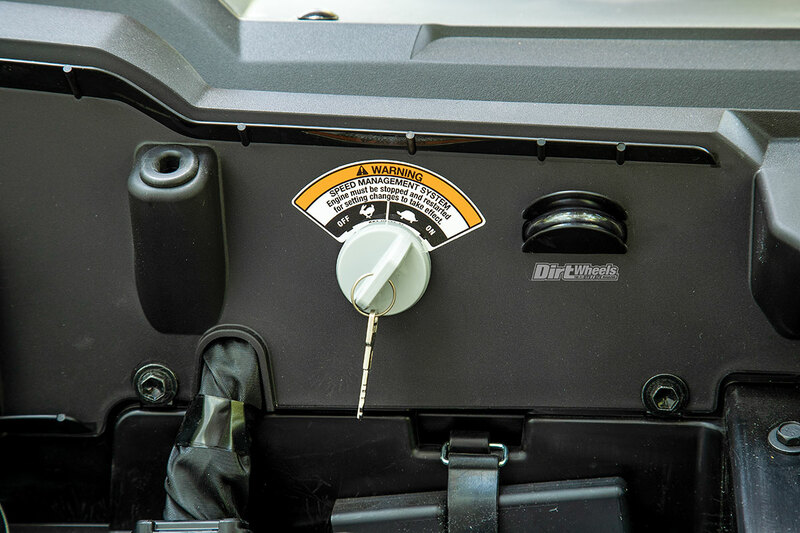 You have a toolkit, the battery, the sound-baffled airbox and, on this unit fitted with a closed cab, the windshield washer reservoir and pump. 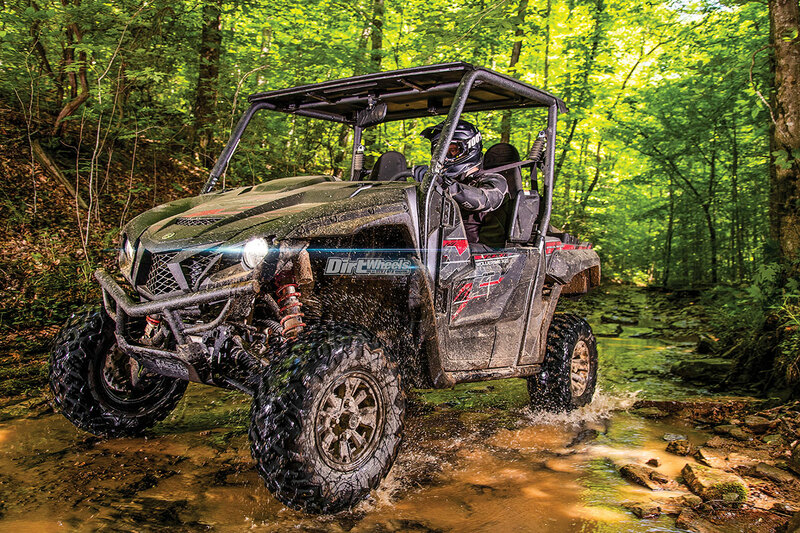 Yamaha chose to introduce the machine at Brimstone Recreation Park in Tennessee. It is a park designed and suited to ATVs and UTVs with all levels of trails. We found plenty of obstacles to test the performance and the ground clearance of the new machine. We don’t remember any difficulty entering or exiting the X4, but the X2 was somehow a little more difficult for tall drivers. We found it easier to raise the steering wheel all the way. The seating is very upright. Even though the seat is adjustable, we didn’t see anyone move one forward. Drivers in the 5-foot-8 range said they’d like the ability to adjust the seat 2 inches further back. Once in the cabin, the seating is comfortable. The doors are full height, though they do dip lower towards the front to aid visibility to the front wheels. Shifting is easy and natural, and there is ample adjustment (12 degrees) in the tilt wheel. Underneath is this key. You can leave it in full-power mode, or switch it to a maximum speed of 25 mph. Take the key and you take most of the fun with you but leave the utility. We had a solid half day in the machine on a good long loop that had all sorts of terrain features. We had steep drops and climbs that were straight but also stair-step rocks and others that twisted and turned. Yamaha had warned that we might rub the rear over-fenders and the edge of the plastic sun top on trees, and we did. We also bumped through rutted, water-filled two-rut tracks where the skid plates dragged and hopped along the center island almost constantly. Yamaha makes bold claims about the Yamaha Ultramatic CV transmission mated to the 850 twin. We selected low range a few times to get a feel for it, but we kept the Wolverine X2 in high range 98 percent of the time. We stayed in high range a number of times where we would have shifted another brand or model into low range to save the belt. The Ultramatic system really is all that Yamaha brags that it is. We never heard or smelled a hot drive belt, and despite the water-filled trails in low areas of the park, we never felt any belt slip from water entering the CVT case. In our opinion, the engine braking is best calibrated for spirited driving and is perhaps a little aggressive for trail-cruising speeds. Yamaha aimed the Wolverine X2 at a specific buyer looking for a compact, nimble machine that excels in tight conditions. We ran the Wolverine X2 through a gamut of trail conditions that ranged from full dust to rain and water actually sluicing over the door tops and into our shoes. 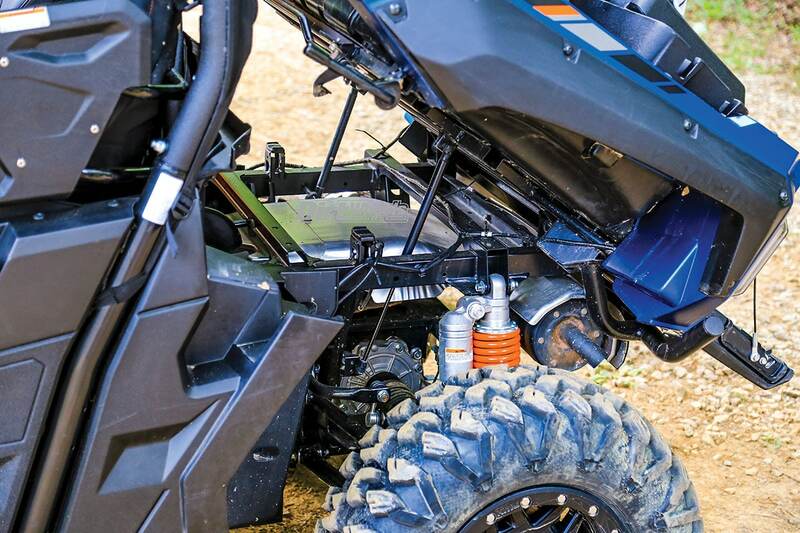 The new engine and transmission combo are ideally suited to trail work. It far outshines Yamaha’s popular 700cc-class singles, and that is not an easy task. The 700 is a proven and tested engine. The combination of power delivery and amazing clutching allows the Wolverine X2 to hook up well in all traction conditions. Some of the situations we found ourselves in were off-cambers that tested the heart rate, but the car stayed planted and secure despite the angle. We admit that the compact philosophy has paid dividends in nimble handling. There is no question that it turns tight and steers accurately. Switching to adjustable KYB shocks has made a large improvement in ride quality, but we would still like to see at least 12 inches of suspension travel. It should be easy to reach those numbers without making the car wider. 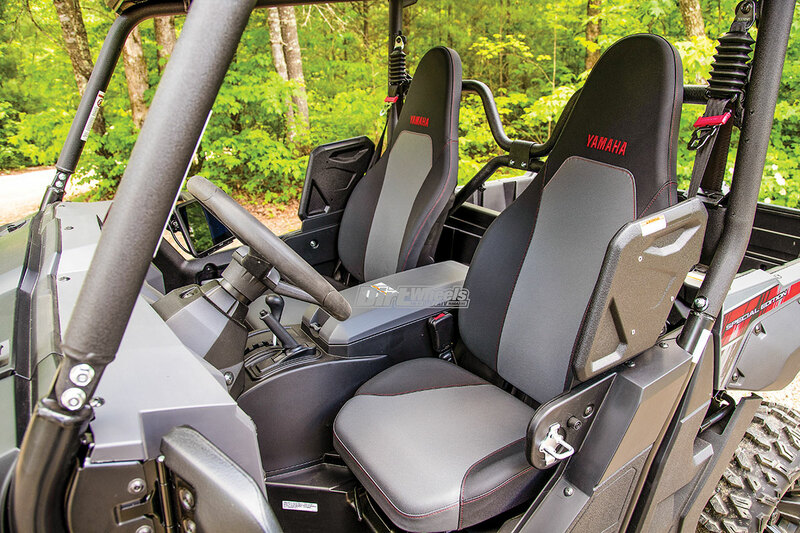 As much as the compact size helps the tight-woods handling, we would trade a slightly longer machine or less bed area for more room for the driver and passenger. Yamaha’s X4 was a smooth, polished machine that has already earned many supporters. We see no reason why the Wolverine X2 shouldn’t do the same. This Wolverine X2 Special Edition is a great-looking machine. The standard model doesn’t have the adjustable shocks or the wheel flares for stopping mud.